The search is on once again for the magic rabbit that will really make a difference in your barn. Nationals is coming up and it is your opportunity to purchase a rabbit from a far away breeder without paying a huge airline shipping fee. It’s an exciting time. Breeders have more for sale on their websites than normal. And if you are in a shopping mood, there are numerous rabbits to be had. 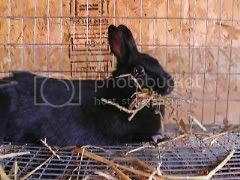 I used to think that it would take one special rabbit to turn my barn around and make it successful. I could use that rabbit as the foundation and cornerstone of my herd. And sometimes, that does happen for people. When a breeder goes out of rabbits, for example, you may be able to acquire a 40-leg rabbit that might not otherwise be available. And he might just do for you exactly what you want, but you really don’t have to wait for the magic rabbit to be successful. I do think it is important to work with quality “ingredient” rabbits. No matter how cleverly you breed, you can’t really make genes appear out of thin air that are not there. But it is not as hard to get your hands on some good genes as I once thought – as long as you are not requiring the ingredient rabbit to also be successful on the table as well. Although I don’t feel that my herd has “arrived,” I do feel that it has begun. That is, I have all of the pieces I need, I’m starting to learn how to use my rabbits together, and I don’t see the need for any additional rabbits for awhile at least. This step, in my mind, comes after buying and selling foundation rabbits and deciding which way you want to go. But it also comes before the step where my pedigrees are completely (or almost completely) filled with “The Nature Trail’s” rabbits. I’ll be there one day – and in the not-too-distant future. But still, I am far enough along, that I can look back at some of my purchases to see what was worth it and what was not worth it. In the “not worth it” column is a single purchase of an expensive doe from a breeder far away from me. Even if the doe produces really well, if I didn’t buy other rabbits to go with her, she’s a genetic outlier. A better choice would be to work with the breeder to put together a well-matched trio of rabbits that have the ability to produce well together, balancing each other’s strengths and weaknesses. This trio would be much more reasonably priced because no one rabbit need be the complete package. I would look for proven does. “Proven” is worth $$$. To pay the inflated price of a Convention or Nationals show for an unproven doe has been “not worth it” to me in the past. If the breeder lives too far away from me, he or she can’t even replace the doe easily if it doesn’t produce, because of the distance. Too often, I’ve ended up with little or nothing to show for the relatively huge investment. In the “not worth it” column, for me at least, are top dollar show bucks. Since I am really not that much into showing other people’s rabbits (though I do from time to time), paying the extra money both in terms of national show inflation and “show quality” hasn’t been really worth it to me. My best sires have been in the $75 to $150 range. In the “worth it” column are brood does and brood bucks. Sure, you are probably going to use the brood buck to get something better and just pass him on. That’s fine. He’s done his job. The brood doe may be with you for a lot longer. It is a lot harder to evaluate a false dwarf Holland. But if you can develop that skill, you can really pick up some bargains. I have purchased several false dwarfs who produced grand champions for me. Also “worth it,” but riskier is the successful doe getting a bit older. The key to buying smart there is to purchase one that recently had a litter and to make a reasonable deal. Either pay very little for the doe, in which case you are just willing to lose the money if it doesn’t work out, or perhaps you can pay if there are live babies (that works best between people who have some sort of relationship). Then, if you get just one really nice, fertile doe, you have gotten your money’s worth and have a nice doe to work with. If your funds are limited, then I would encourage you not to look for the magic rabbit. Buy quality rabbits and be willing to pay what they are worth, certainly. A relatively new breeder said to me the other day that she’s beginning to think that she would have been better off to buy one $200 rabbit than four $50 rabbits. I can’t argue with that. But I would argue that you might be better off to buy three $150 rabbits than one $450 rabbit. And, of course, it all depends on the situation. But I can say that my experience has been that mid-priced rabbits are the best bargains of all.